Samsung Is On A Roll, But Can It Beat Apple? : All Tech Considered The company's long-term position in the smartphone market is complicated because of its historical association with hardware. One analyst says that what really matters to consumers are the software and new experiences. 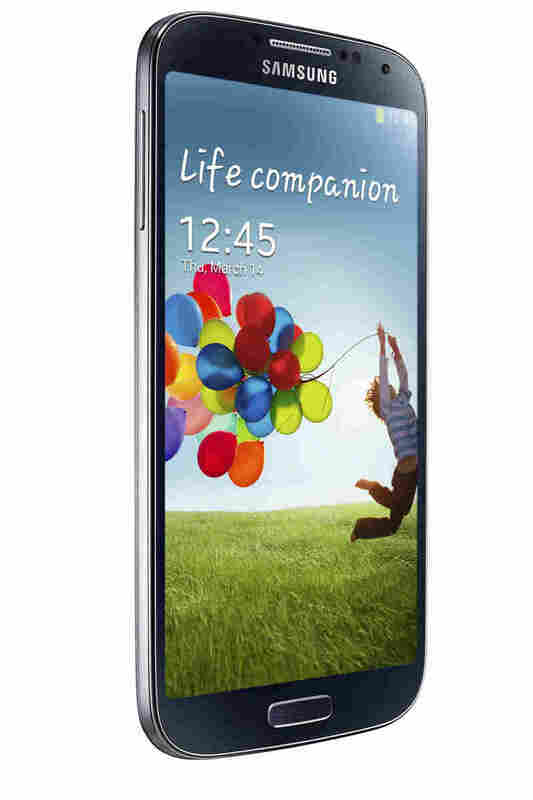 The new Samsung Galaxy S4 has been the subject of buzz in the tech media. Samsung has been on a roll. The hype surrounding its latest smartphone, the Galaxy S4, created a buzz in the tech media — and chatter that Samsung was poised to eat Apple's lunch. But Samsung's long-term position in the smartphone market is more complicated. In August of last year, Samsung accomplished what once seemed almost impossible: Its top-of-the-line smartphone briefly outsold the iPhone. By this winter, the company was confident enough to buy a 2-minute-long Super Bowl commercial and not mention its arch rival even once. Just a few years ago, Samsung was one of more than a half-dozen big companies that were trying to break into the smartphone market by selling phones with Google's Android software. If Apple was Snow White, Samsung was one of Google's seven dwarfs. But today, all that has changed. "They've done a phenomenal job sort of emerging from a pretty large set of handset makers to be the clear leader," says venture capitalist Chris Dixon of Andreessen Horowitz. Samsung sold more smartphones than any company in the world last year. The cash from this part of Samsung's business shot up by more than 50 percent in the last quarter alone. But Dixon doesn't buy into the idea that Apple is about to be unseated. "The closest sort of analog to where Samsung is would be Dell," he says. Dixon says today the smartphone business reminds him a lot of what the PC industry looked like in the 1990s. Analyst Charles Golvin at Forrester Research sees the similarities, too. He says every time a new Android phone comes out, there are "reviews about its CPU and the size of its display and how many pixels per inch and, you know, how big its camera sensor is, blah, blah, blah, and really ... it's boring. "Who cares? What matters is what kinds of software and new experiences can you actually deliver to customers," Golvin says. And it's Google and Apple that are creating those new experiences. Those two companies control the software that powers most phones. Samsung runs Android; Dixon says these platforms also "attract the majority of the users and developers, and get in sort of an increasingly strong position." Apple and Android have created a kind of virtuous cycle, making them more appealing and ever more dominant. But historically, Samsung makes hardware — and market dynamics there are totally different. Samsung doesn't benefit from virtuous cycle. Instead, it's caught in a never-ending foot race. "The prices are driven relentlessly down, and the quality relentlessly up," Dixon says, "eventually to the point where consumers become indifferent to the differences among the different providers, and that leads to a commodity market." Although Samsung had its best quarter ever last year, the profit margin on each new smartphone it sells is slipping. Many analysts believe it's going to be increasingly difficult for Samsung to stand out from other phone makers, unless it can create its own distinctive software. "Which is, by the way, why Samsung is significantly increasing their presence in Silicon Valley," Dixon says. Samsung is spending hundreds of millions building a new campus here, and it's recruiting new programming talents. When it unveiled its latest phone last week, the boldest innovations were not chipsets or a high-def screen. They were programs that could translate languages and edit photos in new, surprising ways. In short, Samsung's new phone was all about software.